I’m posting this on behalf of Jenna Marrone, intern for the processing of the Indian Rights Association records. The story of Native Americans in the United States is not an unfamiliar one. Most of us are at least somewhat aware of the complicated and tragic relationship between the U.S. government and Indian tribes throughout the country’s history. For contemporary audiences, well-known phrases like “The only good Indian is a dead Indian” and “Kill the Indian…and save the man” sound like bad dialogue from an old Western film. 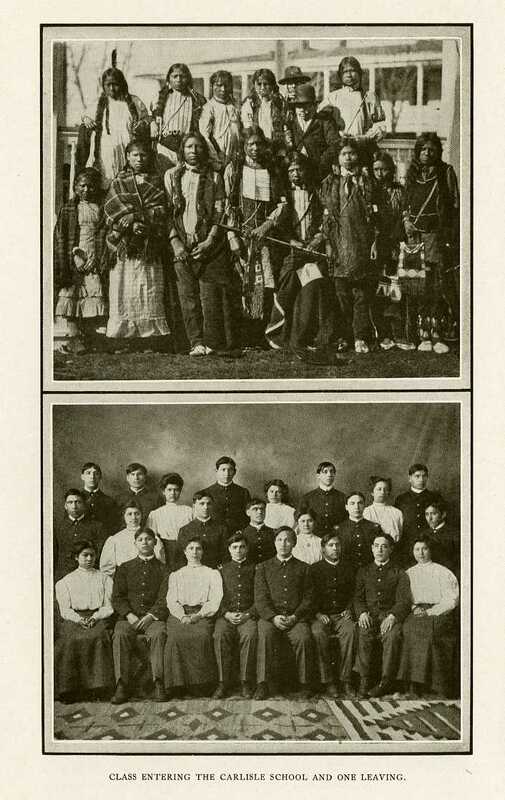 “Are you serious!” I exclaimed one afternoon as I flipped through a 1918 yearbook from the Carlisle Indian School. Willhem glanced up from his desk with an are-you-working-or-are-you-playing-with-the-documents-expression. “Look!” I said, shoving the yearbook at him. It was open to a picture of students dressed for a theatrical production – dressed, may I add, as conquistadors and explorers, among other famous figures from history. “Who would make a Native American dress like Cortez?” I asked as we shook our heads over the picture. 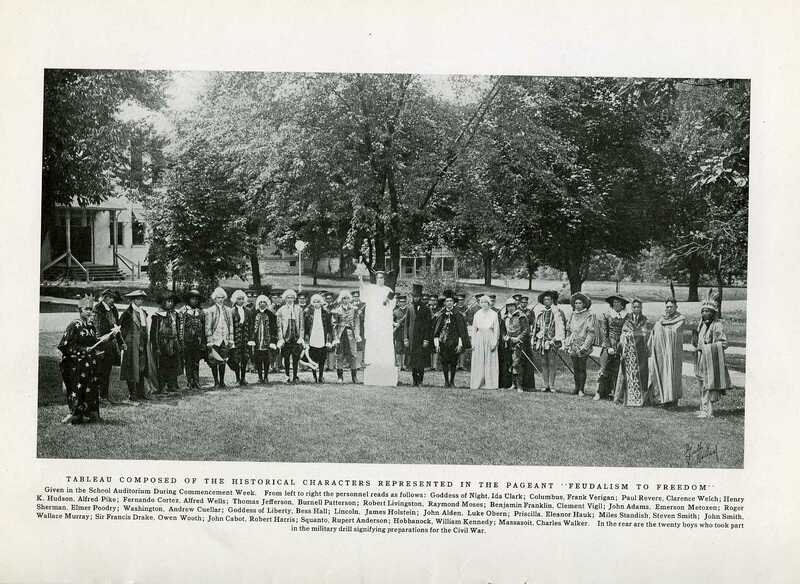 There are many more images like this one in the collection, scattered throughout the annual reports and yearbooks for schools like the Haskell Institute, the Hampton Industrial and Agricultural School, and the Sherman Institute. The philosophy behind these boarding schools was simple: transform young Native Americans into “good citizens” and productive members of society. To achieve this end, Indian schools focused on teaching industrial trades to boys, while girls learned housekeeping or nursing skills. Some children were forcibly removed from their reservations, and many students were given new Anglo names upon arrival. While I’m sure (or rather, hope) that there were some legitimately good intentions floating around there, underneath the positivist rhetoric remains a constant intention to Anglicize the Native American population. 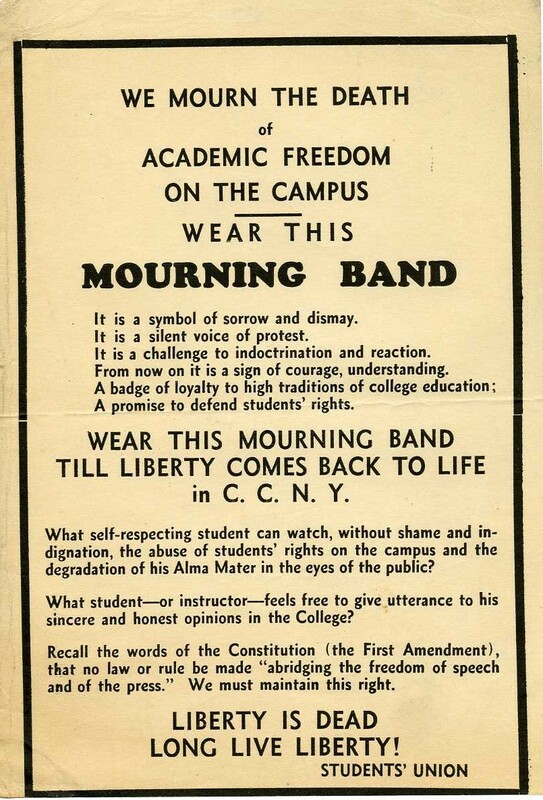 So, what was the IRA’s role in the Indian school movement? What were their intentions in lobbying for Native American rights? And how might we measure their success? The Indian Rights Association records contain answers to all these questions and more. Among the surprising headlines, the occasionally appalling images, and the revealing notes lies a new story waiting to be told. 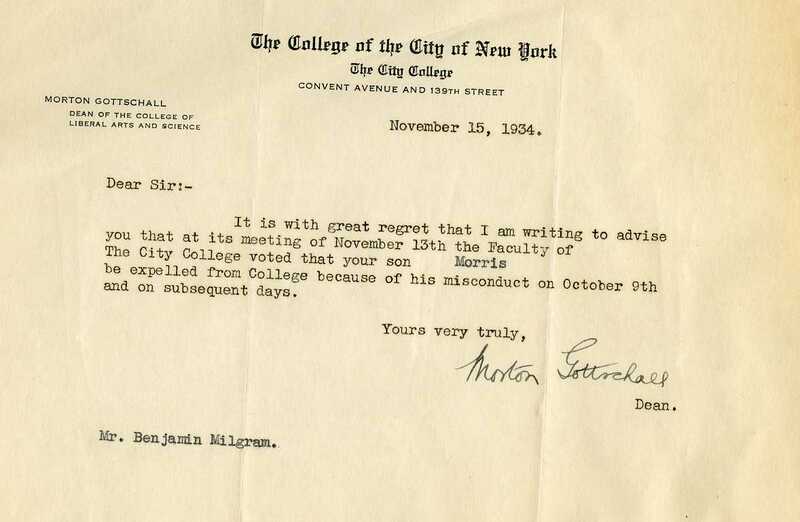 While processing the business records portion of the Morris Milgram Papers I found numerous references to Milgram’s expulsion from CUNY (City College, City University of New York). But that’s all I had seen so far; vague references and comments about how the event was not only revealing of his political compromise in his early years but also a crucial point of departure. After this episode he transferred to Newark University (today part of Rutgers, The State University of New Jersey), graduated, was recruited by the Workers Defense League, and eventually embarked in a trailblazing career as developer of integrated housing. 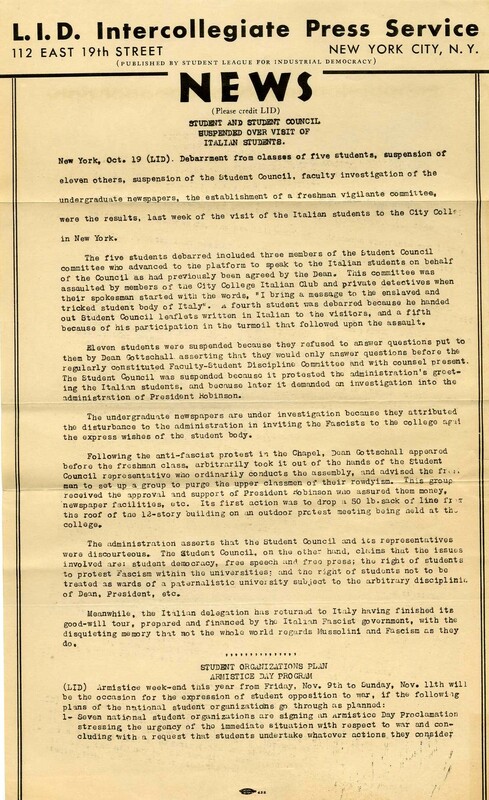 However, once I started arranging his personal and family papers I found many documents about his activism and participation on CUNY’s Student Council. 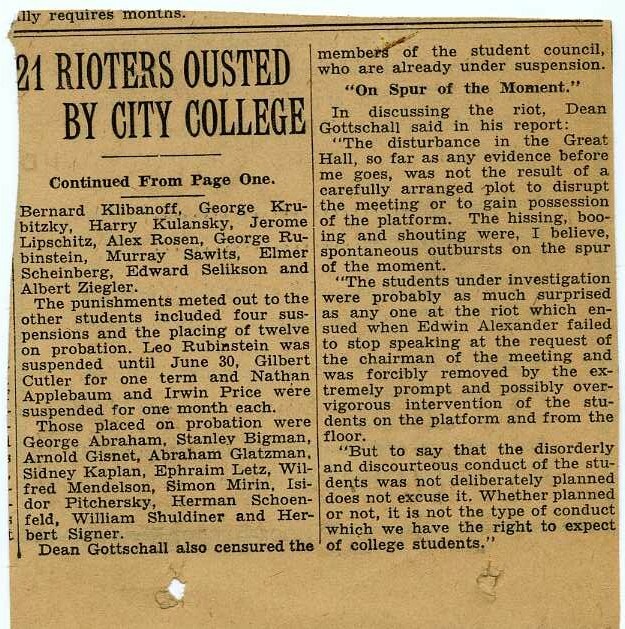 Among these we have several items he kept on the famous incident that provoked his dismissal from CUNY. I’ll let the documents tell the story. All images are part of the Morris Milgram Papers (#2167). This collection is currently being processed and a finding aid will be available by the end of Fall 2o11. 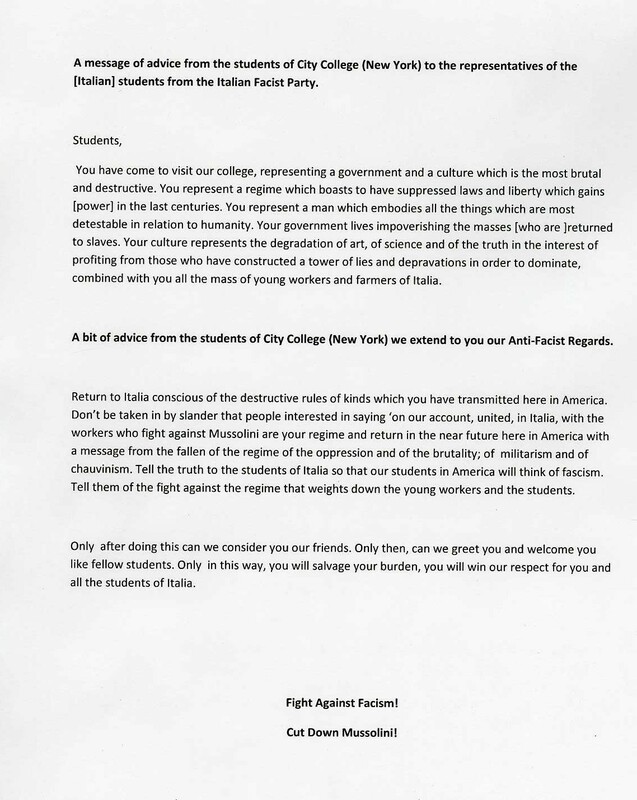 Thanks to HSP Staff member Ashley Harper for the English translation of the message to the Italian students. 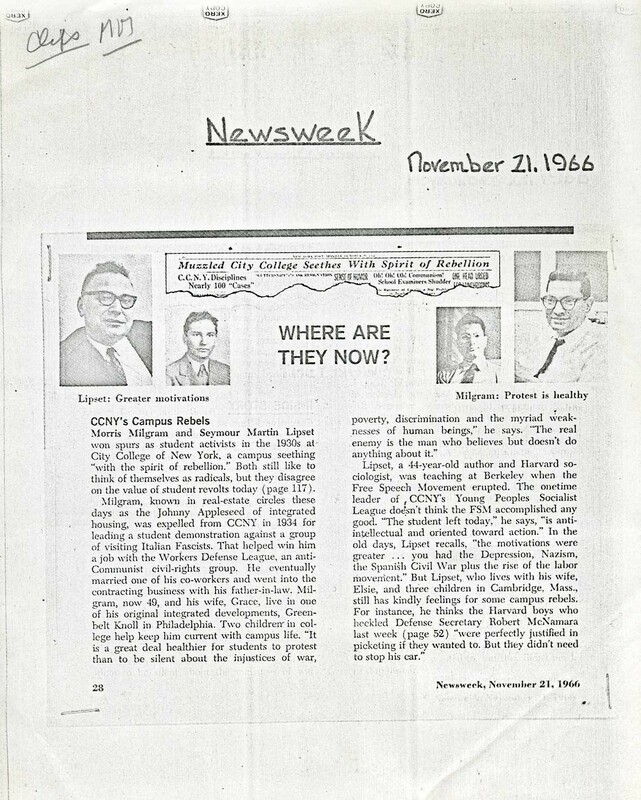 As part of the NHPRC Civic Engagement Project we’ve begun arranging the papers of Morris Milgram. This collection features portions of materials that are nicely organized as well as boxes of loose papers waiting to be sorted; it is a treasure trove of office records and personal documents offering a detailed account of the ins-and-outs of the fair housing movement and a panoramic picture of the 60’s milieu. Morris Milgram was born in 1916 in New York City to Russian immigrants parents. 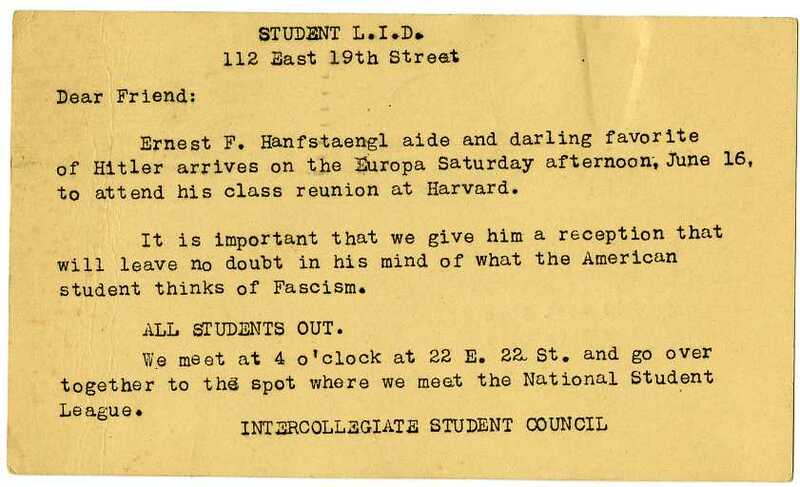 After growing up in Brooklyn he became a college student at City College of the City University of New York from where he was expelled after leading a protest against visiting students representing Mussolini’s Italy. He then enrolled and graduated from Dana College (later Newark University, today part of the Rutgers University system) and found employment with the Workers Defense League. At this agency he started as executive secretary and eventually became national secretary, a position he held until 1947. Right after this Milgram joined Smelo, Inc., a construction company owned by his father-in-law where he learned the basics of the building business and familiarized himself with zoning laws and tax codes. Five years after joining the company he became principal partner and decided to put his knowledge and skills in the service of building integrated housing communities. Milgram’s companies developed many projects of open housing among them Concord Park, Greenbelt Knolt, and Brookside in Pennsylvania. He also build communities in other states but after losing a legal battle against a neighborhood association in Deerfield, Illinois, he switched strategies opting to purchase already built apartment developments to change their rental policies in favor of a more integrated approach. 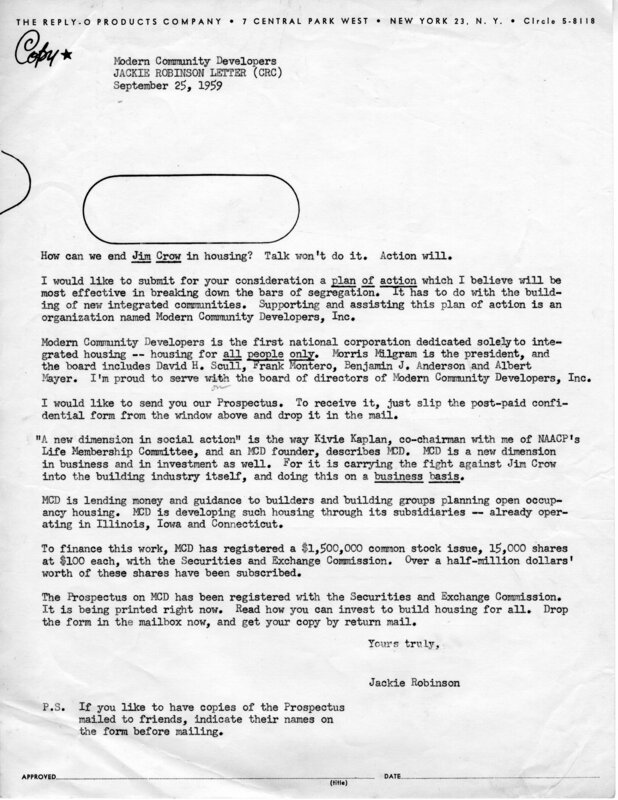 Samples of letters in draft form written by Jackie Robinson for Modern Community Developers, one of Milgram's companies. One of the criticisms frequently brandished against Milgram relates to the methods he used in order to achieve a racial balance in his projects. Milgram used a quota system where, for instance, a particular building would have its tenants divided as 45% black and 55% white. His critics argued that this was a form of discrimination. But Milgram also faced other more pressing challenges. A surplus of black applicants combined with not enough white tenants willing to stay in or move to a particular community made it very difficult to achieve a truly integrated balance. Milgram himself complained about setting up for integration and ending up with more ghettos. He also found that banks weren’t willing to loan money to back up his projects. 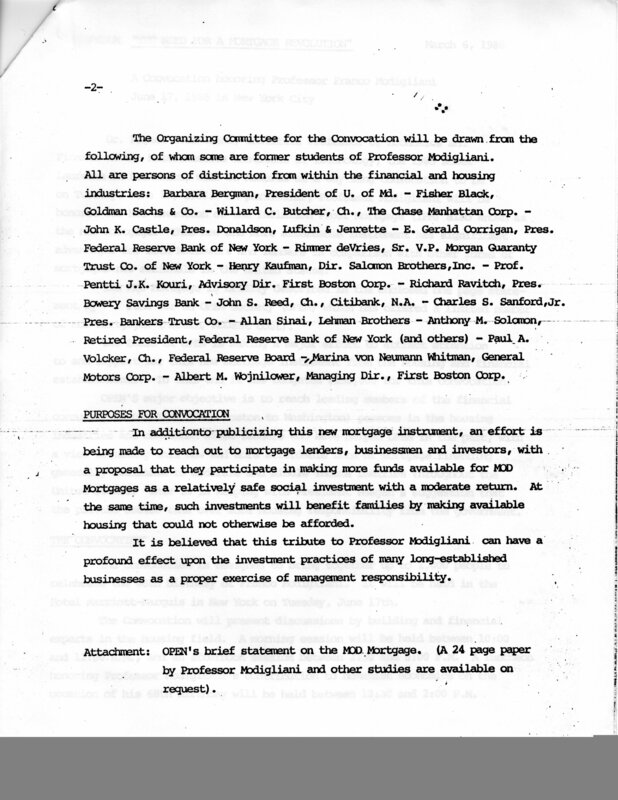 Milgram ended up creating mortgages companies (and doing a lot of fund raising to keep them afloat) to help home buyers financially. It seems that all this work was not particularly successful from an economic standpoint but nevertheless Milgram insisted throughout his life on its moral and social merits. Since the beginning of his open housing efforts, Milgram connected his social project with the civil rights movement’s philosophy. Milgram’s principal partner on his projects was James Farmer, one of the “Big Four” of the Civil Rights Movement and recipient of the Presidential Medal of Freedom, awarded by President Clinton in 1998. In 1975 Milgram and Farmer established Fund for an Open Society (OPEN), a non-profit organization promoting integration in all aspects of society. Milgram also attributed his becoming an advocate of fair housing to a poem written by Pauli Murray, civil rights activist, lawyer, and the first African-American women to be ordained as an Episcopal priest. 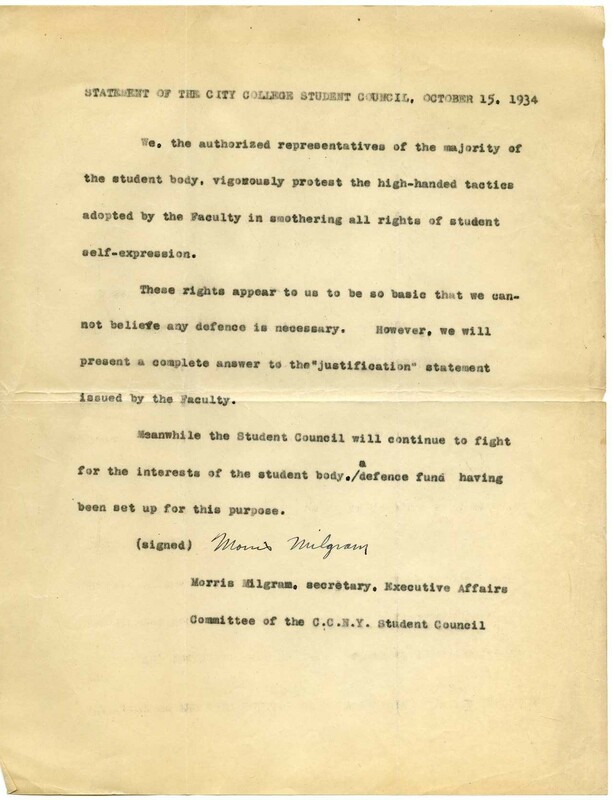 Papers related to Farmer and Murray can be found among the many documents in the Morris Milgram Papers (Collection 2176). 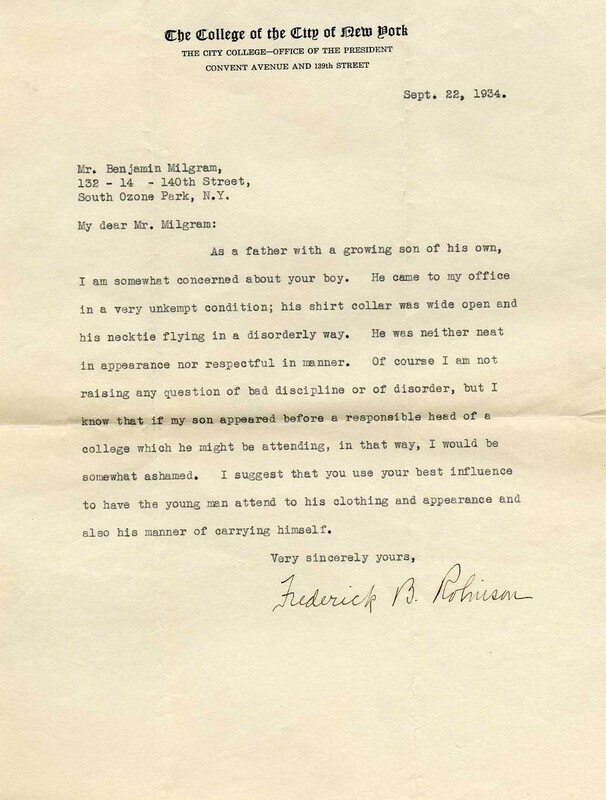 This collection also features a great deal of surprises; Milgram was connected to a considerable number of important figures and his records are full of letters and other documents reflecting this. Franco Modigliani, a Nobel Prize winning economist (more information here and here); Erich Fromm, psychoanalyst and social theorist of the Frankfurt School (more here and here); and Jackie Robinson, baseball star widely known as the player that broke the color barrier in the Major Leagues. 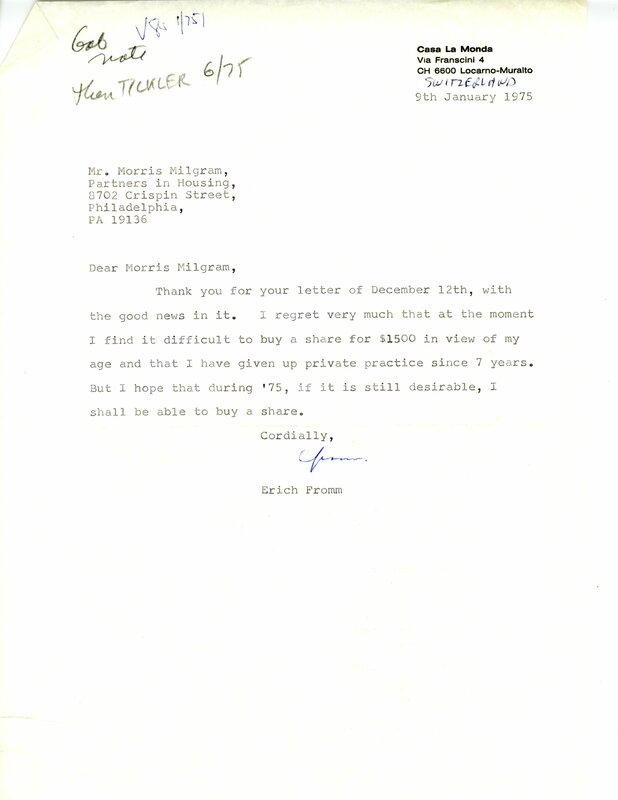 Letter from Erich Fromm respondeing to one of Milgram's invvestment solicitations. 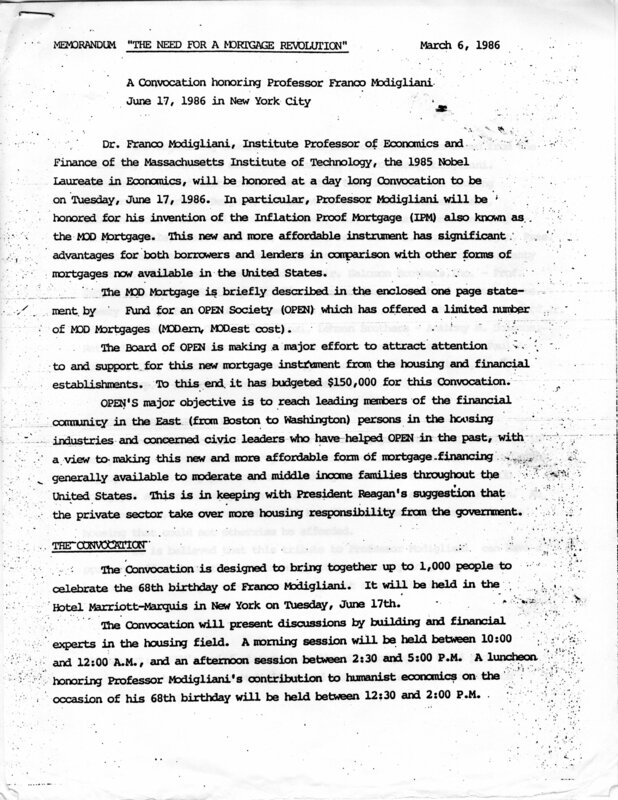 Documents about an OPEN-sponsored event for economist Franco Modigliani. Arranging work on the Albert M. Greenfield papers is almost done but we have lots of work to do to complete the finding aid. This collection is very large, so it’s taking us a lot of time to input the collection’s data into Archivists’ Toolkit, the software we’re using here to create EAD finding aids. Originally the collection consisted of 547 boxes, most of which were cartons holding between 35 and 50 folders, depending on their size. Since these cartons were too heavy, we needed to transfer everything to letter size boxes sorting first through documents that did not fit into the new boxes in order to house them separately. These are now in legal tall boxes or in custom boxes and enclosures made by Leah Mackin, from HSP’s Preservation Lab staff. The remaining folders, once rehoused, were given new numbers according to their sequence in the new boxes. We now have approximately 1,148 boxes and an estimated total of 18,000 folders. All these folders have individual titles and, one by one they need to go into our database. It’s a pretty straight forward but time consuming task. This work has brought a thought I’ve been struggling with for the last month: how do I achieve a balance between the ideal way in which a collection should be processed (and here I’m thinking not only about archival standards but also about the pride one takes when finishing a good product) and the need for researchers to access a collection right now? After all, as archivists and librarians our main goal is to provide access to collections. You could argue that if that is not done – no matter the reasons, arguments, and excuses to “justify” that a collection is not available – then you are straying from the ultimate goal of what information providers are supposed to do. Time is one of the main reasons we can’t have all collections beautifully arranged. (Of course there are also monetary reasons. Budgetary constraints, especially these days, sometimes put limits on what we would like to accomplish. Additionally, the time issue is directly affected by money, as any archivist can attest to.) Philosophical arguments against processing collections in detail are also part of the equation. However, I am of the opinion that in some cases where collections are processed using the “More Product Less Process” approach, access to the collections is improved even though some may argue that MPLP is far from the ideal way to process a collection. If we put aside time, budget, and MPLP, how do we achieve a balance between what we think needs to be done and the pressure from researchers to have immediate access to materials not available anywhere else? (Let’s not forget that one of the main differences between an archive and a library is that, in theory, the former holds unique materials – in most cases manuscripts – and the latter features printed items published in high quantities that may be available either in other libraries, in bookstores, or through interlibrary loan services). I do think and work under the assumption that everything we do has to have the researcher as the crucial element when making decisions regarding the collection. This is also the reasoning behind my opinion on how extensive and deep our narratives about the collection should be. Is it our job to interpret or just to describe? What happens when describing entails interpretation? But this is for another post. The problem in achieving balance arises when you have to make decisions in order to provide access knowing the physical and/or intellectual state of the collection is far from ideal. Fortunately, my experience in the humanities side of academia have taught me researchers interested in a subject will not care if collections are not ideally arranged as long as they have access to them. This fact should ameliorate the problem at least a bit. I do not pretend to oversimplify a situation that encompasses far more circumstances than the ones I’ve mentioned, but I have a feeling that archivist’s reputations are not going to suffer if we put access before the desirable organization of the materials. At least until we have the time and money to do both on a consistent basis. 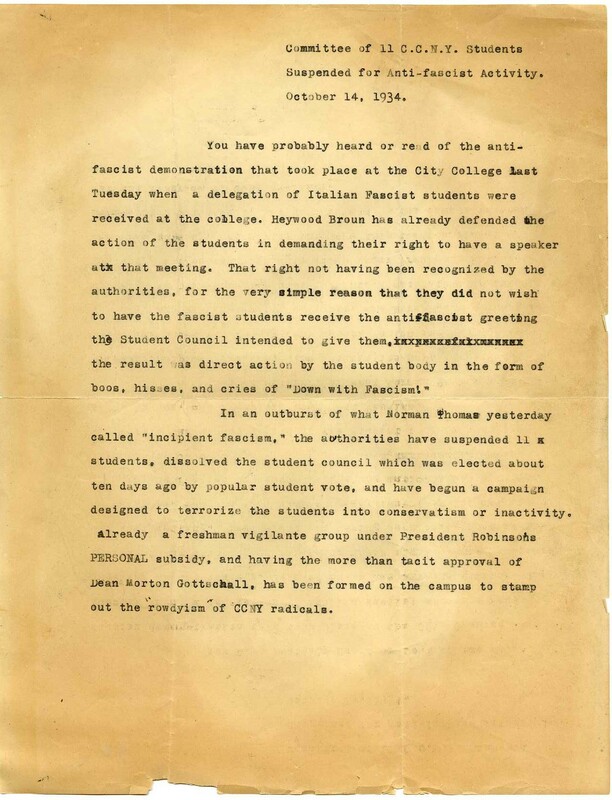 October 29, 2010 by Cary H.
Last September, I began processing the Richardson Dilworth papers as part of the NHPRC Civic Engagement project. 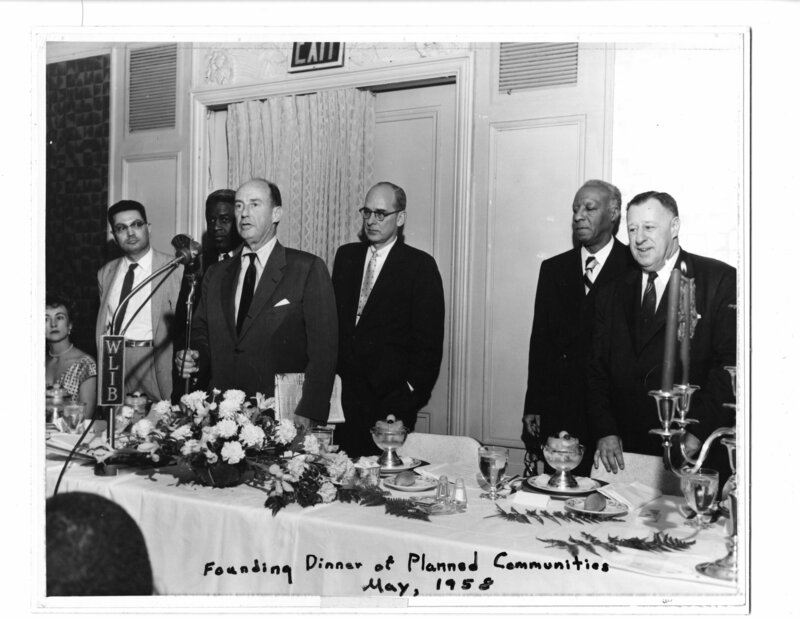 This is a wonderful collection of documents reflecting the social and political life of Philadelphia, particularly during the 1950s, as seen through the eyes of former Philadelphia mayor Richardson Dilworth. 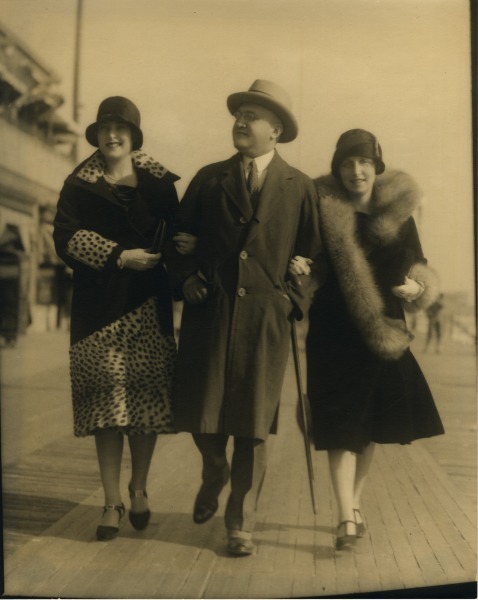 Dilworth was born in Pittsburgh, Pennsylvania, on 29 August 1898, and after finishing a stint in WWI he worked as a lawyer in Philadelphia and became an expert on libel cases after performing counsel for the Philadelphia Inquirer. Working with the firm Evans Bayard and Frick, Dilworth represented several insurance companies, the Philadelphia Transit Company, the Triangle Corporation, Curtis Publishing, Time, Inc., and did trial work in numerous accident cases. During this time Dilworth became one of the most respected trial lawyers in Philadelphia. He also gained first-hand knowledge about the city and the extent of corruption in public agencies. 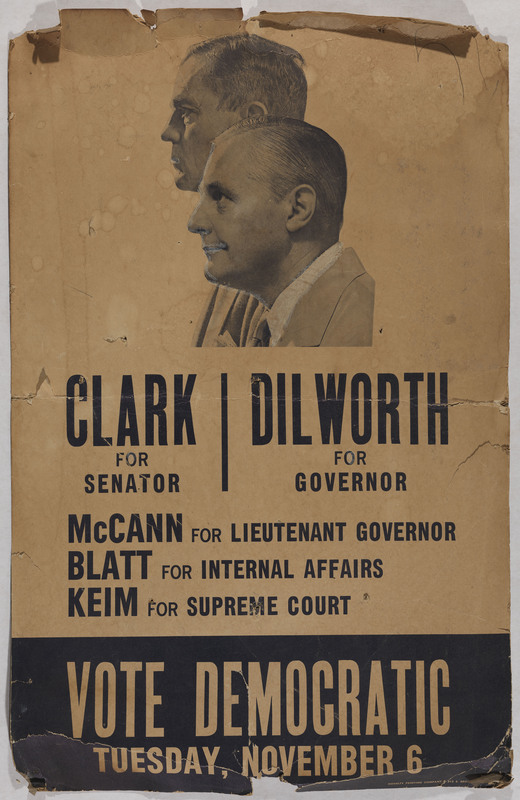 Dilworth was elected Philadelphia city treasurer in 1949 running on a bill that included Joseph S. Clark, Jr. for mayor. Dilworth was elected district attorney in 1952 and later became the 116th mayor of Philadelphia, Pennsylvania. He served as the city’s mayor from 2 January 1956 until resigning in 1962 to run for Governor of Pennsylvania, a race in which he was defeated by William Scranton. 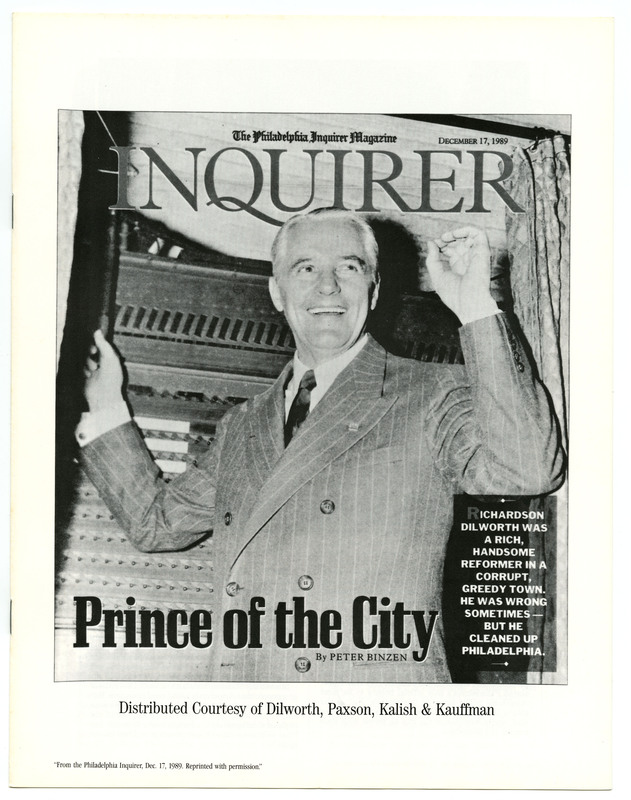 After his tenure as mayor, Dilworth served as partner in the Philadelphia-based law firm of Dilworth Paxson LLP; and, in 1967, he became president of the Philadelphia Board of Education. Heavily involved in the social and urban development of Philadelphia, Dilworth is known as one of the architects of the social reform movement that, among many other things, put a halt to the decline of Center City, developed extensive public housing for low-income families, and contributed to the draft of a new city charter that consolidated county and city offices. 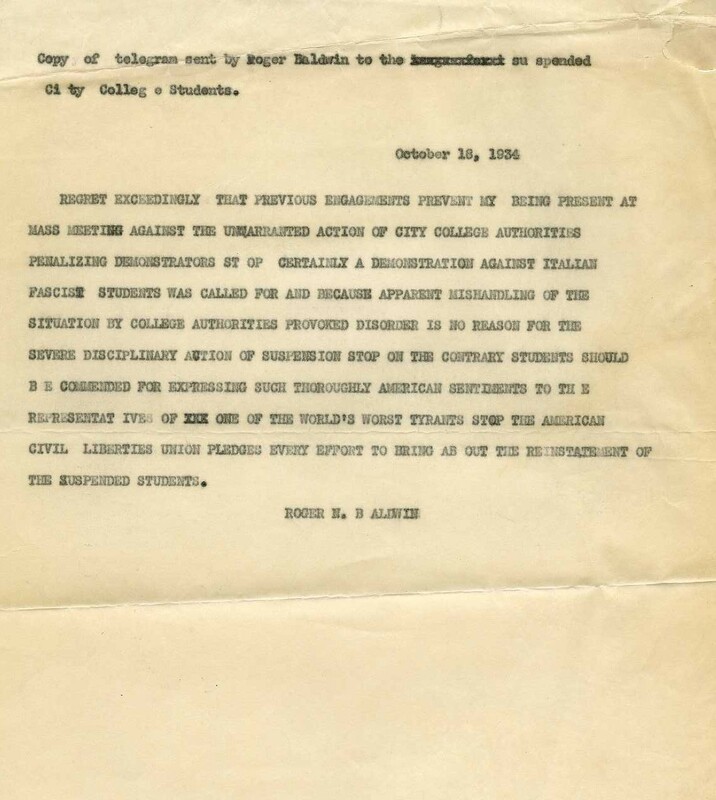 This new charter called for official examinations of potential civic service employees, which contributed to the end of a de facto patronage system (begun by the Republican-dominated administration 67 years previous to Clark becoming mayor) by then pervasive in all city offices and services. The papers I am processing at HSP document the career of Richardson Dilworth, primarily in the form of office records generated in the years before and after he served as Mayor of Philadelphia. The collection has been arranged using, whenever possible, Dilworth’s own filing system, and overall processing is based on the Green-Meissner “more product, less processing” approach. This collection provides an extraordinary behind-the-scenes view of Philadelphia from the perspective of one of the city’s most influential public officials, and is of special interest to researchers on Philadelphia politics, education, urban development, city planning, and United States political history during the 1950’s and 1960’s. Documents in the collection consist of correspondence, reports, political campaign materials, brochures, pamphlets, and scrapbooks. 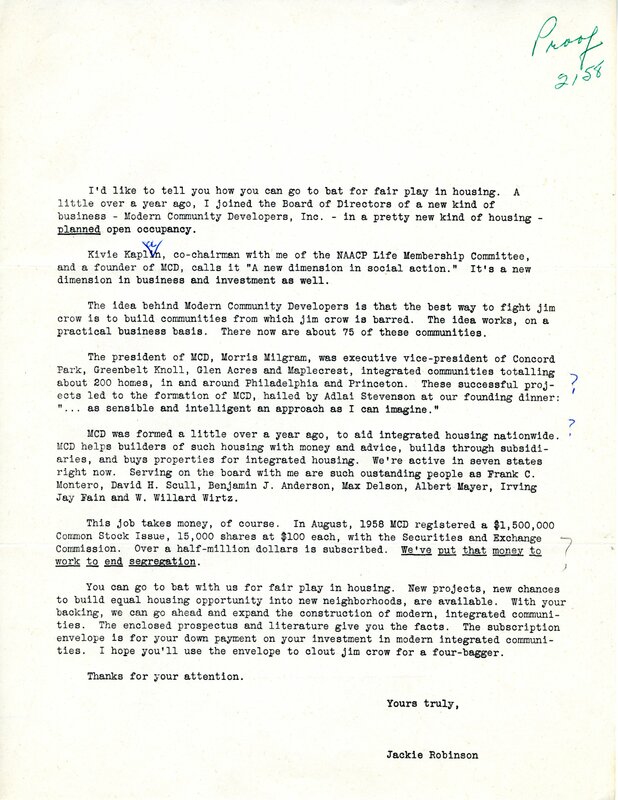 Additionally the collection contains Dilworth’s office files related to his law work (including files from his years as Philadelphia’s District Attorney), Board of Education activities, city planning, housing, civic organizations and projects, the Reading Railroad receivership, and the Pennsylvania Governor’s Committee on Transportation. There is also a sizeable amount of Dilworth’s personal correspondence, as well as clippings he collected on various politicians, campaigns, and political, cultural, and social issues related to Philadelphia. Other material includes numerous photographs, check stubs, typescripts of speeches, and papers related to the naming and dedication of the Richardson Dilworth International terminal at Philadelphia International Airport. 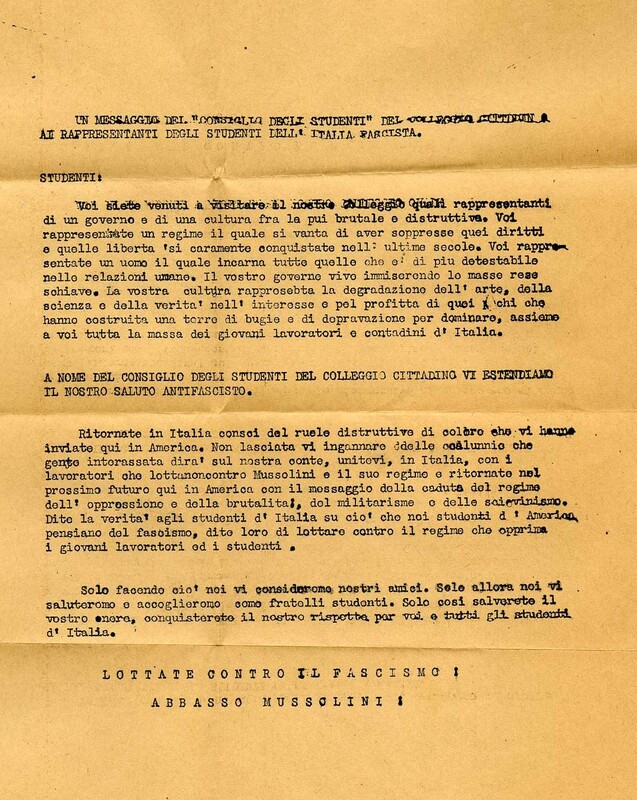 The collection also features personal documents from Dilworth numerous trips abroad, including files related to his trip on the ill-fated SS Andrea Doria. Records generated by Dilworth during his administration as mayor of Philadelphia can be found in the City Archives. For more information on this collection you can contact me at wechevarria@hsp.org, or call 215-732-6200 Ext. 207. Also, a finding aid with the contents of the collection indexed by subject will be available online shortly on the Research and Collections section of our webpage. In the meantime, if you would like to read more about Richardson Dilworth, please point your browser to this article.